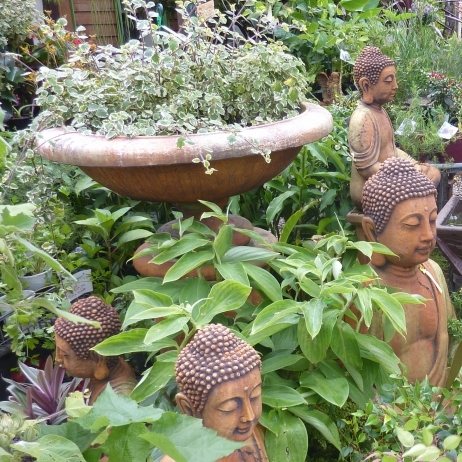 Have a unique nursery experience meandering amongst informally set plants and statues and a varied array of garden/ wall art . From small bedding plants to the super advanced, large grafted sculptural plants and a vast range inbetween. Statues ranging from small pieces set amongst the plants or special place to the large spectacular piece that makes a statement. Large or small. Striking or unobtrusive. Classical. Modern. Oriental. Religious .Humorous. Whimsical. Musical. Functional. Abstract. Animals. Birds. Children. Gargoyles. Dragons. Gnomes. Buddhas. Monks. Seats. Birdbaths. Urns. Troughs. Water bowls. Bonsai pots. Pedestals. Plaques. Wagon wheels. Lanterns. Wall pots. Whatever your style is, this is a comprehensive collection of plants and statuary to suit your own design ideas.